Red dot is flying around the room. This past Sunday I got a call at 7:40 a.m. Calls at that time are rare, and often not happy calls, but I felt I knew who it was when the phone rang. She had had company the day before but he was fine. She had gone in his room and played with him for a while before bed, and later while falling asleep she heard balls jingling in there and heard him playing. Yet in the morning, he was nowhere to be found. She and her boyfriend had searched the room, which wasn’t big and had very little in it, for almost an hour before she called. We talked about the latch on the door, and that she wasn’t sure it had clicked the whole way to latch, but if he had been able to pull the door open, it would likely have been even slightly ajar. Her bedroom door was open, and the steps were open to the first floor. She hadn’t heard anything, and her golden retriever Jelly hadn’t made a peep even though he’s been waiting to meet Smokey. In the room, they had looked in every possible place, and even some impossible, like the closet with the closed door. The windows were closed. They had poked into all the dark places underneath things and into corners and everywhere they could reach. But he was nowhere. She was prepared the spend the rest of the day or more searching her house for him. 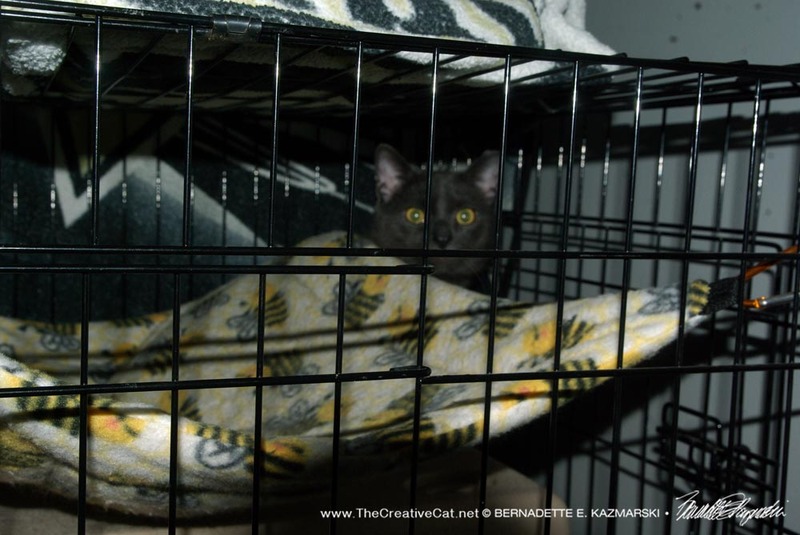 I had a feeling that Smokey was still in the room and hiding, but it would take a person experienced with how some rescued cats react to their environment when they feel unsafe to find his spot. Even though Smokey has seemed totally assured in his room, he had given us a taste of what lay beneath his confidence when he’d been out in the room and playing, but hid inside his crate when Shannon opened his window just a crack for fresh air, and until the window was closed stayed hidden would not even respond to either of us. After the windows were closed, he came out and played and even eventually came over to me on the floor. He may have heard the noises of cars and lawn mowers and conversations outside, or even just felt the “opening” into his space that he couldn’t identify or find, and that was enough for him to go back into hiding. Whether Smokey was still in the room or had escaped and was somewhere else in the house, there was a good chance he was hiding because something about the territory he had certified as “safe” was found to be “unsafe”. Unable to run away from a perceived danger, to protect himself Smokey had taken the only refuge available, he had found a spot barely larger than his own body, protected on all sides, and was holding still in that spot so he would not be found by possible predators. A little overly dramatic? To us, knowing there was no danger to him in that space, yes. But to Smokey, and most other cats, when their perceptions tell them there is danger they can’t fight or flee from they do exactly what I presumed Smokey had done, hide in a place where a predator can’t find them until they feel safe again. The trick was to find that spot, to find a cat who is determined not to be found. 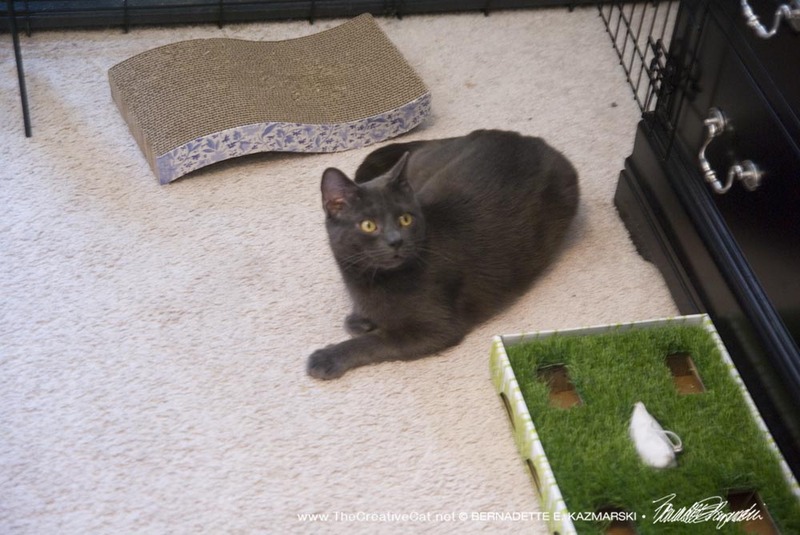 Many cat rescuers will tell you that the foster who escaped the foster room, or the formerly feral or traumatized cat on its first time out of its safe room, will seem to disappear and turn up crouched in a place you would swear you had looked into a dozen times. It’s a look into the instinctive behavior cats have used to save their lives all through feline history. I had a few ideas, but outlined what may have happened if he had left the room, or even if he still was in the room either hiding from being frightened by something, or having a nap in a new place he’d discovered, or that he may have had a health incident and had found a place to hide because he felt he couldn’t defend himself. Smokey was very accustomed to his room, but had no experience with the rest of the house, and on top of that we had no idea if he’d ever lived inside a house at all. Even being in a house might frighten him, trapped indoors when all his experiences had been living outdoors. Judging by his reaction, hiding when Shannon had had the windows open so that he was apparently frightened of the noises, he didn’t have too much experience understanding noises coming in a window. To say cats are territorial doesn’t just mean that they own and protect what they consider their turf and fight off all intruders. A definition of “territorial” more important to your cat is that their territory is their safe space because they have determined predators can’t get to them, food and water are available, the natives are friendly, and they work every day to keep it that way by marking with claws and face to spread their scent. If something changes or if they are displaced from this territory inside your home in any way they may seem to have a total personality change from the friendly and confident cat who always came when you called. Smokey’s territory was that one room. A cat’s survival instinct tells it to get into a place where it is protected on all sides from predators, to keep still and quiet until it becomes familiar with the new space, then begin to explore and adapt to the new reality a little at a time. Initially, they can actually go into a “freeze” mode where they don’t move or react to their environment with wide unblinking eyes staring ahead and a crouch they won’t move from. So to find Smokey outside of his room, we would act as if he was an indoor-only cat who’d escaped his home to the outdoors. Indoor-only cats who’ve escaped outside their territory inside the house rarely go far at the time they escape—once they find themselves outside their territory they look for a place to hide completely and stay there, and they also typically stay completely silent, not moving or answering if they are called, because that is normal cat behavior when outside of their territory and uncertain about predators and their surroundings. Smokey might act in that way just being anywhere outside his room. My guess, from my own experience, is that he may have just turned the corner into Shannon’s bedroom, or what’s happened in my own house when a foster escaped the bathroom before they were ready to leave it: they try to find an exit and keep going until they end up in the farthest point from where they were, usually in the basement. But I really did feel he was still in that room. The odds against his escape were high, and, yes, you can look all over a room with a cat in it and never find the cat. If they feel unsafe and feel the need to hide, I swear they develop a cloak of invisibility spell. I gave her a list of steps to try. First, calm herself. Cats are very perceptive and sensitive to our moods and emotions, and stress might frighten an already frightened cat even more. Put out fresh food, from opening the can or bag, to the scent wafting to the familiar sounds of putting the food in the dish, sometimes that will dislodge a kitty from hiding. Then take another look over the room with a flashlight. Even if you have excellent eyesight and daylight, cats naturally look for small dark spaces, and they can fit inside darned small places when their life depends on it. If a cat is holding completely still whether asleep or frightened you’d be surprised how easily you’d overlook it. A flashlight helps highlight details and most importantly will shine on their eyes in dark spaces and the reflective membrane will glow. I told her to look inside of every closed door and cabinet and inside every trash can and other container, in the underside of the minimal furniture. Then move all the furniture just a little bit, pull it out from the wall and check behind and underneath, and if you don’t find them sometimes just the movement dislodges them from where they are. If you don’t find them, sit down in one spot, preferably on the floor so your height is less imposing, and make a noise they are accustomed to, like crinkling a treat bag or opening a can or jingling a toy, something they know and trust and associate with you. Then, and this may be the hardest thing to do, just sit still, be quiet, and listen. Listen for the slightest shuffle or snuffle or scratch. Be patient. Shannon called within a half hour that she’d found him. She’d gotten to sitting on the floor and crackling the treats bag, and as she listened afterward she heard a slight papery sound. She crackled the bag again and then heard the sound again, locating it in the dresser. She had pulled out all the drawers and did again slowly, but the noise was coming from underneath. She looked behind, in the tiny space between the dresser and the wall, and saw Smokey’s paw pressing out from under the dresser. The backing on the dresser ended at the kickplate with an open space between the end of the backing and the floor, and he had somehow managed to get between the dresser and the wall, and in that 3″ space underneath the dresser. How he got in there, we’ll never know, and it wasn’t likely because he was frightened, but curious. He’d been exploring more and more of his room each day, and this seemed like just an extension of that. He’s been spending more time outside of his crate, and when Shannon or her boyfriend are in there working, he sits on the table next to them. Shannon gives him treats and has begun petting his face between each treat. She won’t be integrating him to her house, just getting him to where he can be handled so we can surrender him to Animal Friends. Thanks to those of you who have! As always, I love being able to help cats. My goal is not just to go out and trap or accept cats, but also to help people resolve issues or help find affordable services, and be a good example to others who are following. I write my articles to give lots of information so that others learn how to do this too, and if they find a cat in a similar circumstance they have an idea what’s entailed, whether it’s TNR or fostering to adopt. Even more than fostering, bringing a cat in from a perilous life outdoors is so rewarding. Helping a person with their cats, even if it means taking some of them to be adopted by someone else, is difficult but often necessary, and I try to be as kind and compassionate as possible. Of course, it’s also time-consuming and has its expenses, and I’m on a tight budget. Thanks to those of you who have sent donations that paid for spays and neuters and food for Smokey and the ferals we TNRd. If any of my readers would like to help me with the spays and neuters for these cats, or gas money, no small amount when running back and forth to fosters and transporting to surgery and to surrender appointments, I would really appreciate it. You can always buy something from my website www.PortraitsOfAnimals.net including the Pittsburgh CAT calendar, below. I’m always working on new items for cat lovers to give as gifts to others or to themselves. Donations can go to my Paypal address bernadette (at) bernadette-k (dot) com, or you can go to Portraits of Animals and purchase a gift certificate in amounts of $5.00 or more and let me know it’s for me, or whatever else you’d like to do. Thanks for following me, and thanks for reading! Gray kitty design even has round eyes just like Smokey! O.M.Geeeee! It’s Bella! On a bag with green button eyes just like her big round eyes! Bella, in silhouette, is stenciled at the bottom of a bag and with just big blue-green eyes that are two-hole buttons sewn on with black thread. Others don’t live in a house full of housepanthers, so I added the white, gray and ginger kitties who are her foster friends. Read more and purchase.